I should start by mentioning that I wasn't a big fan of Sam Raimi's Spiderman franchise. I enjoyed the first film in the cinema and have found it very watchable on repeat DVD viewings. Admittedly, this is mostly due to Willem Dafoe and J. K Simmons, but also due to its excellent blend of humour and dark themes and quite extraordinary action sequences at the time. Spiderman 2 didn't offer up much different for me and never prompted me to watch it again. It did have an excellent villain in Alfred Molina, however. Spiderman 3 was awful. One of the worst films of 2007. Many have questioned the point of rebooting this superhero franchise so soon, and when it covers much of the same territory as Raimi's 2002 film - the origin of Peter Parker's abilities and his motivation for becoming Spider-man and hunting down wrongdoers - this is understandable. 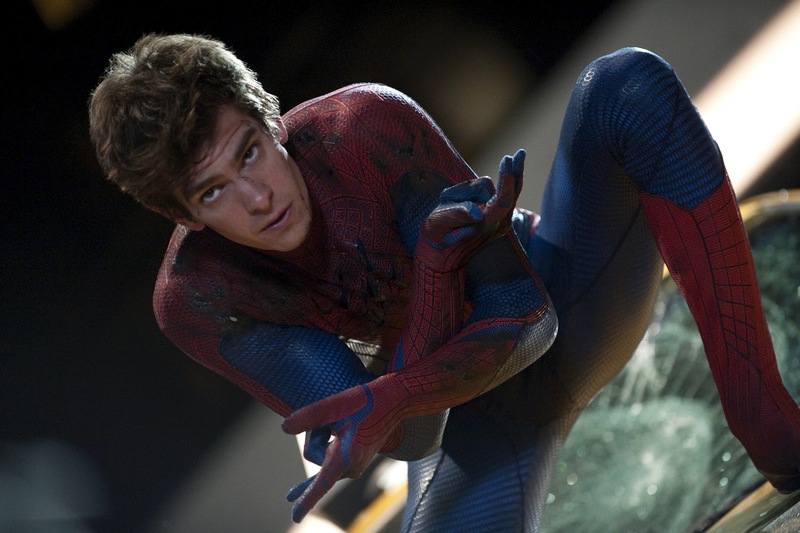 Though director Marc Webb (500 Days of Summer) and the screenwriting team of James Vanderbilt, Alvin Sargent and Steve Kloves have made some significant and admirable changes, mostly to Parker's character himself, The Amazing Spider-Man, because of a disappointing villain and some lacklustre second half plotting, falls short of amazing. Peter Parker (Andrew Garfield), living with his aunt and uncle after the mysterious death of his parents, is led to OsCorp tower after learning that his father once worked alongside Dr. Curt Connors (Rhys Ifans), who has made no contact with Peter ever since. After infiltrating the tower posing as an intern, he learns that Dr. Connors is trying to regenerate limbs and is conducting a series of experiments, while being pressured into devising a cure for the dying head of OsCorp, Norman Osborn. While investigating the tower, Peter finds himself in a room full of genetically modified spiders. When they are released he is bitten and soon finds the extraordinary spider-like abilities manifesting. After harnessing his powers (to an often-amusing extent), and taking to the streets on a vigilante mission to hunt down the man responsible for his uncle's death, Peter has to overcome some bad press and being the target of Captain George Stacy (Denis Leary), convinced he is a public menace, to take down Connors' alter-ego, The Lizard. Connors' human testing on his regenerative serum has resulted in him transforming into a 9ft tall lizard, terrorising the city and beset on transforming the citizens into lizards by releasing a chemical cloud from the top of OsCorp Tower. Inevitably there are going to be comparisons made between this and Raimi's Spiderman, and I do think there are some features that work better here. The casting of Garfield is certainly one of the strengths. Garfield's Peter Parker is not a full-on geek like Toby Maguire's was. He's still a science brain and usually has a camera around his neck, but it is just the one classmate (a jock named Flash Thompson) who gives him a hard time and not the whole school. Early in the film, Peter actually gets beaten up defending a nerd from his antagonist. He's not unpopular and is actually more of a skateboarding rebel than anything, but he's shy around girls, especially the attractive Gwen Stacey (Emma Stone, perfectly cast and underused) who has an eye for him. It would have been hard to accept Peter if he was any less popular because he is a genuinely nice guy and it is Andrew Garfield after all. Martin Sheen and Sally Field were also well cast as Ben and May Parker. There are some tender moments shared between the three, especially when Peter starts to piece together clues about his father's secrets. Ben and May don't try and replace his parents, but are realistically concerned for his well-being and try and provide discipline, especially when he starts to behave erratically. Both are convincing, and though Ben's death is a poorly staged scene, it is effective on an emotional level. Peter is balancing a lot of emotions - his confusion about his father, coming to terms with his exciting new abilities, falling in love with Gwen - and it is quite a thoughtful character study. What is admirable about The Amazing Spider-Man was the fact that Peter's decisions as Spider-man reflect those he makes in his own life. I much preferred the build-up - Peter messing around with his abilities; humiliating Flash, accidentally taking down a bunch of people in the subway and his awkward exchanges with Gwen - to the action-packed second half because the storytelling greatly suffered due to implausibility and plot holes and that truly aggravating police chief, who rather than try and take down the city's primary threat, decides to focus on taking down the city's only fighting chance. The visual effects are impressive enough, but there were very few occasions when I was in awe of what I was watching. The captures of Spider-man flying through the air and the POV shots (heavily criticised after being used in the trailer) were very good. Webb can also be commended for giving the film an atmosphere that resembles a comic book. Some of the film's most ridiculous moments - Peter's entire infiltration of OsCorp would have been a joke if it weren't for Stone's presence - can be forgiven because it is a comic book film. It was hard to be invested in the action sequences, however. One taking place on a bridge didn't arouse much interest, and the recurring involvement of one character from this scene is ridiculous. Ultimately The Amazing Spider-Man works well enough because of the fresh faces brought in and the strength of the scenes featuring Peter Parker as a disillusioned teenager. Garfield and Stone are talented young performers, and though they seem to be a little old, easily eclipse Maguire and Kirsten Dunst on chemistry alone. The story is familiar and not particularly engaging, the film's pacing is all over the place (and as a result the 136 minutes feels arduous), and with the exception of the climactic struggle, none of the action sequences are especially exciting. It’s a solid blockbuster, but not a very memorable one. My favourite of the first three Spiderman films was 2. Great villain, better action scenes, and yeah, Simons was hilarious. I quite liked 1 as well, but 2 raised the bar for superhero films. So I had high hopes for Spidey 3; but having multiple villains I thought superhero films were finally exploring the possibilities of the superhero form, that the comics do all the time. But unfortunately it was very poorly done. The current Marvel movie franchise, culminating in The Avengers, has done introduced comic book-like soap and complexity really well though. "...by having multiple villains..." I meant. I really liked The Avengers, but comic book films don't really interest me. They're entertaining enough in a cinema, but I never have any urge to re-watch them. The Avengers has been one exception (and Spiderman/Batman are others). Spiderman 3 was very poorly done. Boring story, and a ludicrous final act. This is solid, but certainly nothing spectacular. You liked it a bit better than I did :) I loved the casting of Garfield and Stone (all the cast, really) and I much preferred the first half, but the film just bored me overall (and I hated the POV shots). Stone's Gwen Stacy > Dunst's Mary Jane, Garfield > Maguire! I much preferred the first half too. I didn't like Gwen's father, though. Hated that character. I like Ifans but he was a pretty boring villain. His development from simply wanting to regenerate a limb to taking over the city came about far to quickly. Oddly I liked the POV shots. At least it provided an example of the 3D being warranted. A heap of the film has no business being in 3D. Yeah I wouldn't go in expecting a masterpiece, but there is plenty to admire about Webb's film. Many have loved it, and many have hated it. I came out neutral. A difficult film to write about, hence my somewhat misguided ramble haha. There is a lot of talent, and the casting is very good. I haven't seen it yet but from your assessment, it seems like the series has the potential to construct a much stronger sequel. After all, it is only Marc Webb's second movie. Can't wait to see it, preferably in theaters if I get the chance. It is only Webb's second feature? How great was 500 Days of Summer for a debut. I think he was well suited here because the romance plot is effectively done. The action isn't so effective, but I think there is potential for an excellent sequel and it would be great to have him back on board. The foundation has been set and Garfield is terrific. Interesting to read about Stone and Garfield being better than Dunst and McGuire, I thought their chemistry was pretty good so I guess I'm in for a treat with this film. Shame it's not better though, I really think it was waaaay too soon for reboot. It is way too soon. I didn't really like Macguire, but when you have a villain as awesome as Dafoe it doesn't really matter. Here, there is no Dafoe. You may really enjoy it. I hope you do. I'm afraid I didn't like this film as much as you. I felt Emma Stone was great and the best thing about it, but I can't agree on Garfield. He simply looks too old for the role. I know he's not much older than Maguire was, but Garfield looks even older than he actually is. Also, I couldn't ignore the bad writing (such as the security lapse you mentioned). Once upon a time superhero movies were a joke and I could shut my brain off. Since then there have been some, like the recent Avengers, that have shown that we should expect more from superhero films than just some silly plot to skip over to get to the action.